Labernard (Labrador/St. 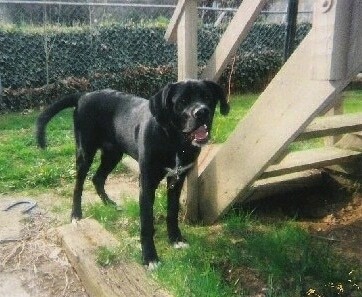 Bernard)—"These are some pictures of my Labernard Toby, a 135–lb. male. 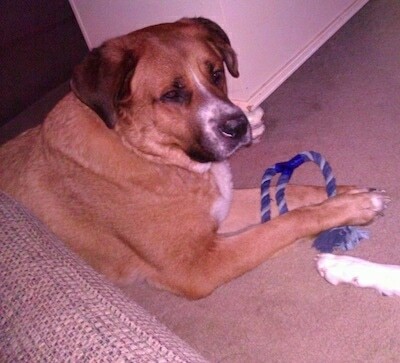 He has the temperament of both breeds. The loving loyalty of the St. Bernard and Labrador, the protective qualities of a St. Bernard, all while being the gentle giant they both can be. He is one big teddy bear!!" The Labernard is not a purebred dog. It is a cross between the Labrador Retriever and the Saint Bernard. The best way to determine the temperament of a mixed breed is to look up all breeds in the cross and know you can get any combination of any of the characteristics found in either breed. Not all of these designer hybrid dogs being bred are 50% purebred to 50% purebred. It is very common for breeders to breed multi-generation crosses. 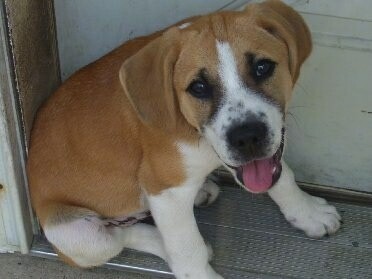 "Ben as a 5-month-old puppy in the picture, St. Bernard / Lab mix; it is easy to see the St. Bernard." 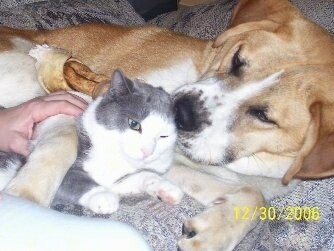 "Ben (dog, 7 months) and his brother Sammy (cat, 4 years)." 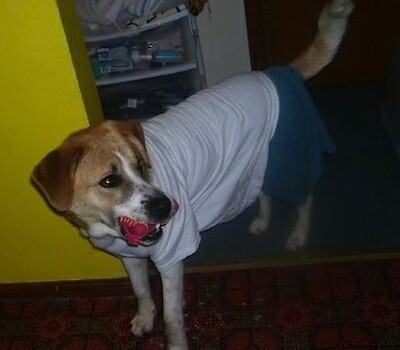 "Ben (10 months) all dressed up in his shirt and boxer shorts with a toy in his mouth." "This is a photo I took of my puppy Samson. He is 7 months old and weighs 75 pounds in this picture! 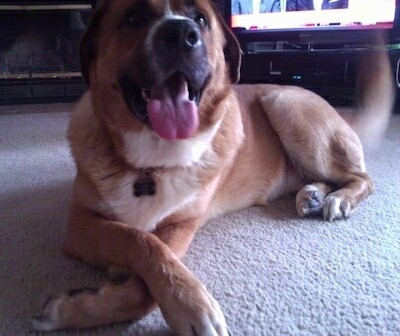 His mom was a purebred black Lab and his Daddy a purebred St. Bernard. Samson is a big, goofy, clumsy puppy who is the happiest when he is around people. He's very good at wearing himself out by chewing rawhides, running in the yard or chasing his tail! Because he is still a puppy he loves to chew...but thankfully he sticks to tearing apart his own toys, not our shoes or home. Samson is currently being trained, and picks up on his obedience skills very fast, even though he has a short attention span. He's very good at waiting for the "ok" to eat, go out the door or chase a toy, and is even catching on to playing dead! He loves all people and dogs equally, but is very protective over his backyard...he will sit in the middle of the yard and growl and bark if he sees something he is unsure of! One of his favorite things while outside is to find the biggest fallen tree limb and carry it all over. Oh, did I mention he loves water?! He loves hoses, sprinklers, mud holes with water, and putting his dirty paws in his water bowl and "digging" in it after he drinks. Samson loves digging holes, and despite our efforts of teaching him to have only one spot to dig, he still digs many holes! 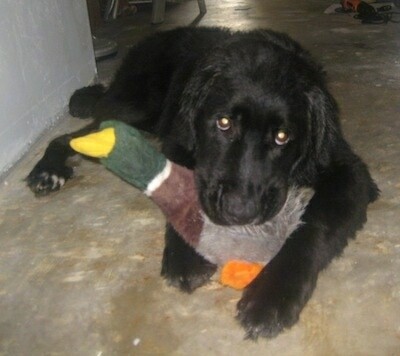 He is very sweet and gentle and loyal, and pretty much lets you do anything with him you want!" "This is Domino. His mother is a purebred St. Bernard and his father is a purebred black Labrador." 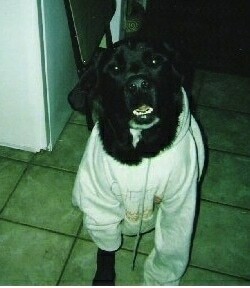 "This is Domino wearing a sweatshirt. 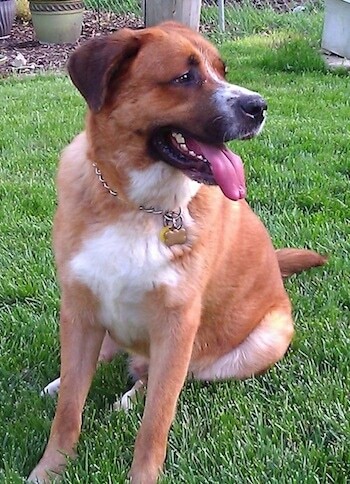 His mother is a purebred St. Bernard and his father is a purebred black Labrador."